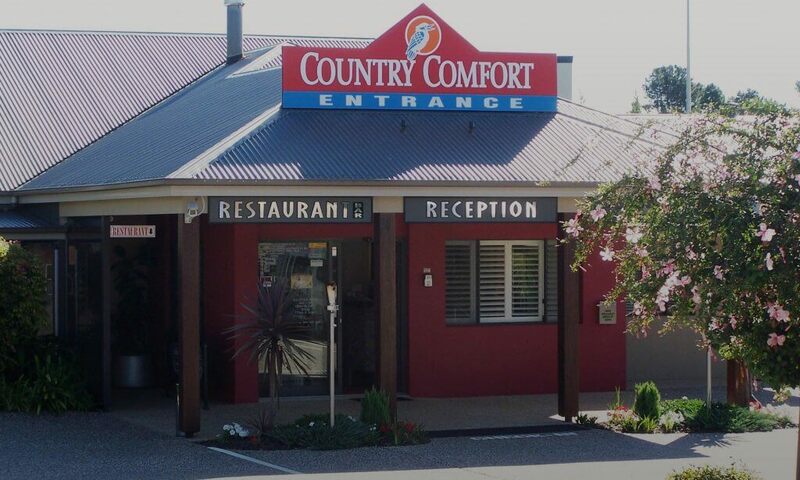 Country Comfort Toowoomba is located in the beautiful and historic suburb of Highfields, about 10 minutes drive north of the Toowoomba CBD. Offering good old fashioned country hospitality, this will be your home away from home. Sample country hospitality and feel right at home with the comforts and conveniences we provide. We have put in Wi-Fi in our rooms, and HD televisions because we understand the importance of staying connected. Enjoy the relaxed, casual atmosphere of our motel, meticulously clean rooms and fresh quality food. A cosy room with a queen bed, desk, fridge, HDTV, tea & coffee making facilities, hairdryer. A generous room with a queen bed, desk, fridge, HDTV, tea & coffee making facilities, hairdryer. Free Wi-Fi and Austar Cable TV are provided. A generous room with a king bed and a sofa bed, desk, fridge, HDTV, tea & coffee making facilities, hairdryer. Take in the cosy and warm ambience at Lily's Restaurant, Bar & Lounge while you enjoy our modern à la carte menu. Our warm and friendly staff will prepare and serve the freshest and best local produce from the Darling Downs region. Enjoy the open fire in the cooler months or keep warm in the fully covered alfresco area in the warmer months. If you are here in September, don't miss the Toowoomba Carnival of Flowers from 15 - 24 September. Now in its 68th year, the carnival is attended by visitors all over Australia. Set in spectacular gardens, the carnival also offers live music and local food and wine and more. Various locations. Please check website for details. Spring Bluff Railway Station is a heritage listed site located on the main railway line between Ipswich and Toowoomba. Take in 150 years of railway history and enjoy its beautiful landscaped gardens at the café. About 13km away, a 12-minute drive. Step back into history at the Highfields Pioneer Village and learn about where it all started. Walk through a Heritage chapel, a few museums, a vintage toyshop, a slab cottage to see what life was like for the pioneers. It is a well preserved heritage tourist attraction at a very affordable price. Open daily from 10am to 4pm. About 4km away – a 5 minute drive. Picnic Point Toowoomba, located some 700 metres above sea level, has been popular for its fresh mountain air, the camera obscura & Peters ice creams at Picnic Point kiosk. Its cafe boasts a great vantage point for panoramic views of the region. Perfect for a cup of coffee, glass of wine, an ice cream, or a fabulous meal. Dinner is served in the restaurant Friday & Saturday nights. The Chocolate Cottage and Café begun in April 1997 in the restored 1877 original Highfields school house. All chocolates are produced in-house. The cafe now seats 230 and serves meals 6 days per week from 8.30am to 5pm. Situated on a grassy acreage overlooking unsurpassed views of the Toowoomba Range, the cafe has plenty of room for the family with shaded outdoor seating and warm indoor dining around a fireplace throughout winter. There are some 60 different varieties of chocolates here to choose from. It has an extensive range of lollies and chocolates. A good family spot to visit. Just 1km from the hotel. Black Forest Hill Grandfather and Cuckoo Clock Centre showcases thousands of different cuckoo clocks and almost 100 German grandfather clocks. There is a variety of wall, mantle and even modern quartz clocks available. Open 6 days (8.30am to 4.30pm Tues – Fri and 9.30am to 4.00pm Sat & Sun) a week. It was started by a German 25 years ago as he wanted to share the clock-making traditions of the Black Forest region of Southwest Germany. Today it is owned and operated by Robyn and Jim Rich. They purchased the business in late 2005 when the original owners decided to return to live in Germany. Just 5.6km away. Abbie Lane Arts & Craft Village is a unique shopping experience. With an old church as a beauitful landmark, it is set amongst cottage gardens and surrounded by old style buildings. There are six shops in total offering gifts, real estate, clothing, homewares, and homemade yummies from The Cafe. A beautiful place to visit and meet friends to have a meal, or share a coffee and some sweets. Just a short walk from the hotel (350 metres).